I love organization… and simplicity!! Combining the two makes my heart happy. 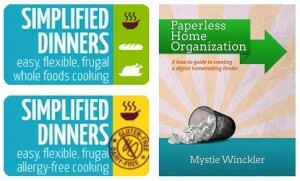 Mystie Winkler has done just that with her fabulous three new ebooks from Simplified Pantry– Simplified Dinners, Simplified Dinners- Gluten-free / Dairy-free, and Paperless Home Organization. I was thrilled when the TOS Crew signed on to review all three of these great resources, but the Simplified Dinners- GF/DF – really caught my eye. We have been mostly GF for a few years now (due to health issues) and the one thing I have found with this challenging diet is that there is no “simple” about it. I was excited to see how Mystie might have taken the “challenging” out of the equation. Simplified Dinners- GF/DF is a fabulous resource for anyone – those on a strict GF/DF diet, or those beginners wanting to try out an alternative eating style. I know I was going to love this book in the very beginning “Why Simplify” section where Mystie explains, “Paring down my pantry, purging my recipes, and printing out the processes freed up my mental energy for other things in life – even making it easier to let the children help in the kitchen.” That would be my dream- a simple, efficient cooking plan that freed my brain up for the other million responsibilities I tote. I dove right in! The first few pages of this book ease you into the understanding of why and how simplifying your pantry and cooking process is so necessary. The GF/DF book includes a “Know your Ingredients” page which is a valuable tool for any newbie GF eater. It quickly identifies many potentially hazardous food that could contain gluten and dairy which might not be easy to discern. The “Master Pantry List” is also a great tool and it provides a comprehensive list of items that are great to have on hand when preparing to embark on a new cooking plan. Then the book dives into a great array of easy to prepare, simple, and healthy recipes. Do not be worried, however, Mystie does not disappoint- these recipes are also super YUMMY!! At the very end there is a great Meal Planning Chart to use with your Simplified Pantry!! Simplified Dinners and Simplified Dinners- GF/DF can be purchased here for $12.99 each. Paperless Home Organization can be purchased here for $3.99. (All three are available on Kindle or as a PDF download). I love the “Why Simplify” explanation- it fits well with my way of thinking and my goal this year of being intentional!! I love that the recipes are simple and yummy- a win-win in my book!! I love that Mystie uses words like “dash” and “splash” in her instructions – she totally gets me!! I love that this book can help people understand that Gluten Free cooking does not have to be complicated and expensive. My family loves that we now have new variety in our meal plan- new yummy recipes makes them happy!! I think these books are a great resource for anyone wanting (or needing) to simplify the hassle of meal planning, grocery shopping, meal preparation, and cooking. As moms we have so many things on our plate (no pun intended) and making this part of life easier really does free us up for other important issues (like relaxing, warm bubble baths)! !